QUITO, ECUADOR — This holiday wouldn't even be legal in the United States. 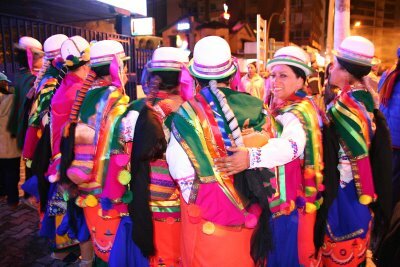 I'm talking about Fiestas de Quito, a city-wide festival to celebrate the founding of Quito by the Spanish on December 6, 1534. The official holiday falls on the 6th, but Fiestas de Quito kicks off on November 30, beginning a week-long period of partying. And I do mean partying. Streets are crowded until all hours of the night, bars practically flinging their doors open to the crowds, and brass bands cruise the city playing the same song over and over again. There are dozens of live concerts, a beauty pageant, various competitions, and bullfights featuring the best matadors from Ecuador and around the world. One of the most popular traditions during Fiestas de Quito is to ride around the city for hours on open-air buses called chivas. The basic idea is to cram as many people as possible onto a chiva, toss in a brass band, a liberal supply of liquor, noisemakers, flags, and - if it interests you - fireworks. The band typicially goes on the roof, and passengers ride wherever they can find space: on the roof, the back, hanging off the side... you get the idea. The chiva proceeds to cruise all over Quito amidst throngs of celebrations as passengers drink, make noise, wave flags, and shoot roman candles at whatever (and whoever) they feel like. The first night of Fiestas de Quito I joined about 40 of my closest friends from the South American Explorer's Club for our very own chiva party. Being first-time chiva partiers we weren't completely versed in chiva party etiquette, and as a result nobody thought to bring roman candles to randomly fire into crowds, though we managed to get all the other paraphernalia in place. 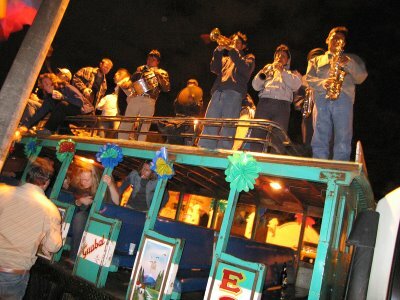 Our bus arrived, complete with brass band on roof, and like crazy college kids we piled on and began partying. 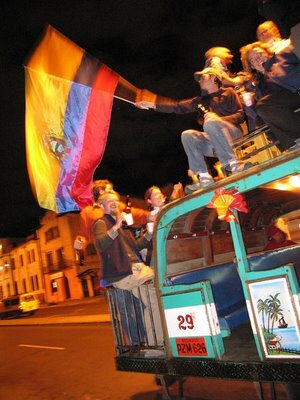 Our chiva cruised in the direction of Old Town Quito, with its colonial vibe and large plazas. Upon reaching the Old Town we slowed to a crawl in places as our driver negotiated the road covered by thousands of party-goers. Vendors sold food and drinks as we passed by, kids with squirt guns would occasionally open fire, and balls of fire shot from roman candles passed over our heads. The brass band never missed a beat and the party aboard the bus never broke stride. 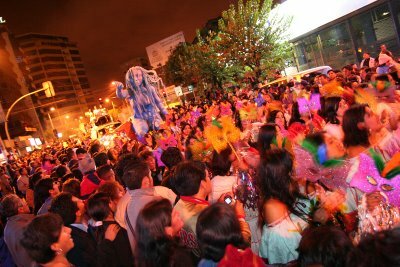 The week of partying is capped off by a giant nighttime parade down one of Quito's main avenues. Imagine a parade on the scale of the Rose Parade, combined with the party atmosphere of Mardi Gras, along with a hefty dose of fireworks being ignited by people in the crowd. Grand floats pass by one after another, indigenous people dress in traditional outfits and dance, and beauty queens pass by waving to the crowd. 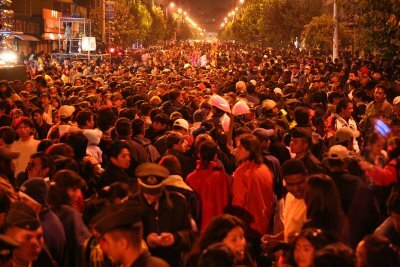 Unlike parades in the U.S., however, where spectators obediently observe a barrier separating them from the parade, spectators in Quito surge into the street between almost every float, only to surge back the other direction as the next one threatens to run them down. It's a different way of doing things. It's the Ecuadorian way!